Kathleen Kennedy is an American-born film producer and a production company executive. She co-owns the film and TV production company Amblin Entertainment in collaboration with Steven Spielberg and her filmmaker husband, Frank Marshall. Kennedy has collaborated with Spielberg on some major box-office hits including the 1982 sci-fi flick E.T. the Extra-Terrestrial, the Jurassic Park franchise and the Indiana Jones film series. In her longrunning career, Kennedy has been involved in the making of more than 60 movies all of which have grossed over $11 billion at the global box office. Her films have also garnered at least 8 Academy Award nominations and in 2018, iconic producer received an Honorary Oscar for her brilliant work. Kathleen Kennedy was born on June 5, 1953, in Berkeley, California. Her mother Dione Marie “Dede” (née Dousseau) was a stage actress while her father Donald R. Kennedy earned his living as an attorney and later as a judge. She has two siblings, a twin sister named Connie and another sister Dana. She had her high school education at Shasta High School in Redding, California graduating in 1971. For college, she attended San Diego State University where she majored in telecommunications and film. Kennedy’s work in TV production dates back to her final year of college. Then, she got employed at a San Diego-based TV station KCST where she performed a diverse range of duties including camera operator, video editor, floor director and she ultimately became the station’s news production coordinator. Her last role at the station was as the producer of a local talk show You’re On before eventually moving to Los Angeles. Her first job in Los Angeles was as an assistant to filmmaker John Milius who was at that time working on a Steven Spielberg movie 1941 (1979). Kennedy made a number of outstanding contributions during the production of 1941 and thus, she caught the attention of Spielberg who eventually hired her. Kennedy’s earlier projects with Spielberg were the films Raiders of the Lost Ark (1981) and Poltergeist (1982) in which she was credited as an associate producer. She earned her first producer credit came in the sci-fi film E.T. the Extra-Terrestrial (1982) which was a major box-office hit. This marked the beginning of a highly illustrious business partnership between Kennedy and Spielberg as she continued to work on most of his films for several years after. They are best known for their work on the Jurassic Park film series as well as the Indiana Jones franchise, both of which were mega box-office hits. Their work relationship of over 3 decades equally includes other blockbuster films like The Color Purple (1985), Hook (1991), Schindler’s List (1993), A.I. Artificial Intelligence (2001), War of the Worlds (2005), The Adventures of Tintin (2011) and Lincoln (2012). Kathleen Kennedy has also headed several major production companies in the course of her long-running career. For many years, she served as the president of Amblin Entertainment which she co-founded with Steven Spielberg and her husband Frank Marshall. She equally headed another reputable production company The Kennedy/Marshall Company between 1991 and 2012. Kennedy currently serves as the president of Lucasfilm Ltd., a position she has held since October 2012. With Lucasfilm, she has continued to create timeless movie experiences most notably the Star Wars film franchise. Kathleen Kennedy found her breakthrough as a film producer at a relatively early stage of her career. Her astounding success with the Indiana Jones films in the 1980s helped establish her as a force to be reckoned with in Hollywood. Time after time, the iconic producer has continued to deliver similar results at the box-office and there seems to be no slowing down for her in the near future. Her net worth is currently estimated at a whopping $150 million. Kathleen Kennedy has been married for over 3 decades to a fellow filmmaker Frank Marshall. In addition to having an exemplary marital union, this husband and wife duo are known to be frequent collaborators and they have achieved much success on a professional level. Back in 1992, they co-founded the Kennedy/Marshall (KM) production company in addition to being co-owners of Amblin Entertainment with Steven Spielberg. She has two children with her husband Frank Marshall, daughters Lily Marshall and Megan Marshall. However, unlike their famous parents, the Marshall daughters have kept off the media radar for the most part of their lives. 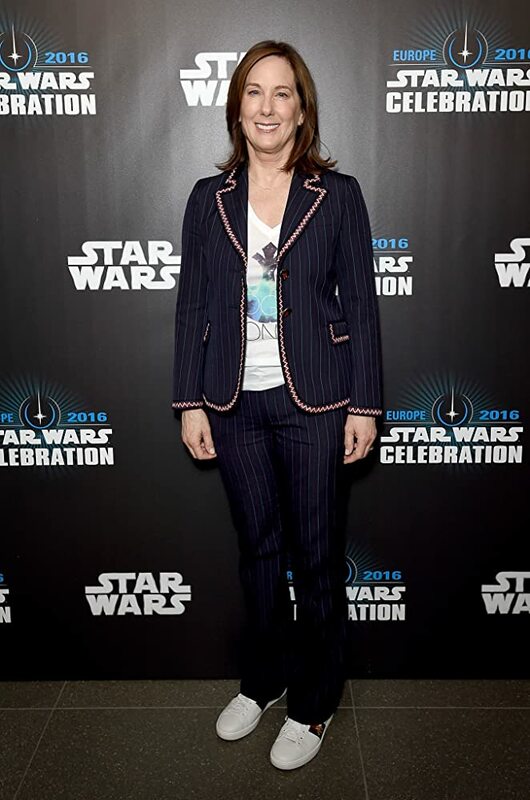 Kathleen Kennedy is definitely one of the most influential women in Hollywood and also in the world. She was ranked number 77 on the Forbes list of the World’s 100 most powerful women for 2017.